ggellerman updated subscribers of T123683: Put link to onboarding Phab board in New tech employee orientation wiki. ggellerman closed T123683: Put link to onboarding Phab board in New tech employee orientation wiki as Declined. ggellerman added a comment to T123683: Put link to onboarding Phab board in New tech employee orientation wiki. I believe it had something to do with familiarizing new employees with Phab. @Aklapper I don't believe such a board was ever created in the past 3 years. I will check with @JAufrecht to see if creating one would still make sense. ggellerman added a comment to T216067: Recover from corrupted beta MySQL slave (deployment-db04). ggellerman closed T200486: Edit migrated Team Practices Group content to make it appropriate for Technical Program Management site as Resolved. ggellerman closed T200486: Edit migrated Team Practices Group content to make it appropriate for Technical Program Management site, a subtask of T200482: MediaWiki Technical Program Management site, as Resolved. ggellerman moved T200486: Edit migrated Team Practices Group content to make it appropriate for Technical Program Management site from Backlog to Done on the Technical Program Management board. ggellerman added a comment to T200486: Edit migrated Team Practices Group content to make it appropriate for Technical Program Management site. I've reviewed tools at https://www.mediawiki.org/wiki/Audiences_Technical_Program_Management#Tools,_Practices,_and_Presentations_we_like and I am comfortable with that list. Can we close this task? ggellerman moved T207325: Footnote weirdness after editing the title parameter from Up next to External on the TemplateStyles board. ggellerman updated subscribers of T206527: [BUG] Citations not being parsed correctly. ggellerman updated subscribers of T200914: Allow creation of TemplateStyles in the Module namespace. ggellerman updated subscribers of T198618: TOC processing should strip contents of <style> tags. ggellerman updated subscribers of T200614: Provide a way to document template styles or add other text to those pages. ggellerman updated subscribers of T200632: Allow template parameters to provide CSS to a templatestyles stylesheet. ggellerman updated subscribers of T205787: TemplateStyles throws inaccurate errors without providing a save-anyway option. ggellerman updated subscribers of T205803: Duplicate reference name errors in English Wikipedia caused by MediaWiki templatestyle handling?. ggellerman updated subscribers of T162379: Decide which non-standard CSS properties to support in TemplateStyles. ggellerman updated subscribers of T200687: MCR support in TemplateStyles. ggellerman added a comment to T204853: Security Issue Access Request for MBinder_WMF. ggellerman added a comment to T200484: Update Team Practices Group site to indicate current status. ggellerman added a comment to T200564: Share project page template for FY1819 Q2 with teams in Audiences. Shared with Audience-Leads with due date of 2018-09-21 for commenting. ggellerman triaged T200564: Share project page template for FY1819 Q2 with teams in Audiences as Normal priority. ggellerman moved T200482: MediaWiki Technical Program Management site from In Progress to Blocked on the Technical Program Management board. ggellerman added a project to T203416: Document which CSS properties are supported in TemplateStyles: Documentation. ggellerman moved T197563: Template styles get ignored when switching to Visual Editor from Doing to Done on the TemplateStyles board. ggellerman added a comment to T202172: Team days at All Hands - Design, Prod Design Strategy, AHT, Parsing, Programs, Language. ggellerman updated the task description for T202172: Team days at All Hands - Design, Prod Design Strategy, AHT, Parsing, Programs, Language. ggellerman added a comment to T202168: Set expectations for planning team days during All Hands. ggellerman reassigned T202172: Team days at All Hands - Design, Prod Design Strategy, AHT, Parsing, Programs, Language from ggellerman to LGoto. ggellerman updated subscribers of T197617: TemplateStyles should be able to add skin-specific CSS. @Jdlrobson Glad to hear that this is useful! ggellerman added a comment to T197617: TemplateStyles should be able to add skin-specific CSS. ggellerman added a comment to T202169: Team days at All Hands - Web, CommTech, Prod Analytics, Multimedia. Thank you @MBinder_WMF ! Yes, I would defer to JK when he returns. ggellerman added a comment to T202587: "Leave site?" message erroneously shown after user has saved an edit and is back in read mode. Thanks, @Deskana ! Let me know if you need more specifics from me. Please tell PMs/Eng Managers to submit requests for meeting space during All-Hands to eng-admin@. 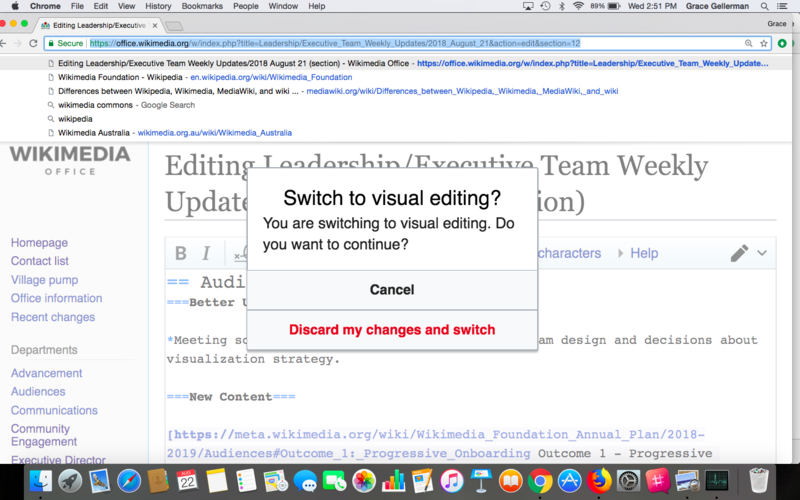 go to https://office.wikimedia.org/w/index.php?title=Leadership/Executive_Team_Weekly_Updates/2018_August_21 and click Edit, it takes me to wikitext editor. ggellerman added a comment to T202586: confusing error message. ggellerman updated subscribers of T202168: Set expectations for planning team days during All Hands. Please hold off on sending teams to eng-admin until I speak with @MNeisler on 2018-08-23 re: process we want to follow for directing requests. Stay tuned. ggellerman triaged T202172: Team days at All Hands - Design, Prod Design Strategy, AHT, Parsing, Programs, Language as Normal priority. ggellerman moved T202172: Team days at All Hands - Design, Prod Design Strategy, AHT, Parsing, Programs, Language from Backlog to In Progress on the Technical Program Management board. ggellerman created T202422: Phab training and board set up for Editing design. ggellerman created T202172: Team days at All Hands - Design, Prod Design Strategy, AHT, Parsing, Programs, Language. ggellerman created T202171: Team days at All Hands - Android, iOS, Reading Infra. ggellerman created T202170: Team days at All Hands - Editing and Growth. ggellerman created T202169: Team days at All Hands - Web, CommTech, Prod Analytics, Multimedia. ggellerman created T202168: Set expectations for planning team days during All Hands. ggellerman updated the task description for T200448: Tools (Phabricator) survey in Audiences. Thanks for taking the lead here, @MBinder_WMF ! @Aklapper Please feel free to move the phab pages if you think that they belong somewhere else. Thanks for the detailed explanation, @Quiddity. I would prefer not to confuse the purpose of the 2 teams by linking them with a redirect. To that end, I like this option https://www.mediawiki.org/wiki/Template:Historical. If you think that the Obsolete tag that you attached is the way to go, then I think that we should use it. I believe that @LGoto has already used that tag. ggellerman added a comment to T200933: Clear funding decision process for WMF attendees of the Wikimedia Hackathon 2019 in Prague . Let's talk more about this in late August or early September to see how much I can help. Would that work? ggellerman added a comment to T200485: Interesting links to migrate from Team Practices Group content to Technical Program Management. @MBinder_WMF and I to talk about identified content. ggellerman placed T200484: Update Team Practices Group site to indicate current status up for grabs. ggellerman renamed T200485: Interesting links to migrate from Team Practices Group content to Technical Program Management from Interesting links to migrated Team Practices Group content on Technical Program Management to Interesting links to migrate from Team Practices Group content to Technical Program Management. ggellerman moved T200483: Identify relevant content from Team Practices Group site to merge into Technical Program Management site from To Do to Done on the Technical Program Management board. ggellerman created T200564: Share project page template for FY1819 Q2 with teams in Audiences. ggellerman moved T200483: Identify relevant content from Team Practices Group site to merge into Technical Program Management site from Done to To Do on the Technical Program Management board. ggellerman moved T200483: Identify relevant content from Team Practices Group site to merge into Technical Program Management site from Backlog to Done on the Technical Program Management board. ggellerman added a comment to T200490: Draft content for Technical Program Management site. ggellerman moved T200490: Draft content for Technical Program Management site from Backlog to Done on the Technical Program Management board. ggellerman triaged T200490: Draft content for Technical Program Management site as Normal priority. ggellerman moved T200489: Create initial site for Technical Program Management from Backlog to Done on the Technical Program Management board. ggellerman triaged T200489: Create initial site for Technical Program Management as Normal priority. ggellerman triaged T200486: Edit migrated Team Practices Group content to make it appropriate for Technical Program Management site as Normal priority. ggellerman triaged T200485: Interesting links to migrate from Team Practices Group content to Technical Program Management as Normal priority. ggellerman triaged T200484: Update Team Practices Group site to indicate current status as Normal priority. ggellerman triaged T200483: Identify relevant content from Team Practices Group site to merge into Technical Program Management site as Normal priority. ggellerman moved T200482: MediaWiki Technical Program Management site from Backlog to To Do on the Technical Program Management board. ggellerman triaged T200482: MediaWiki Technical Program Management site as Normal priority. ggellerman created T200482: MediaWiki Technical Program Management site. ggellerman triaged T200448: Tools (Phabricator) survey in Audiences as Normal priority. ggellerman moved T200448: Tools (Phabricator) survey in Audiences from Backlog to To Do on the Technical Program Management board. ggellerman created T200448: Tools (Phabricator) survey in Audiences. ggellerman updated subscribers of T199909: Deploy TemplateStyles everywhere on 2018-08-09.
ggellerman added a comment to T199909: Deploy TemplateStyles everywhere on 2018-08-09.
ggellerman added a comment to T197603: Deploy TemplateStyles to the English Wikipedia on 2018-07-19. @Pcoombe Great and thank you! Do you see any issues from fundraising/CentralNotice perspective with deploying TemplateStyles everywhere on 2018-08-09? Thanks! @Pcoombe Do you see any issues with deploying TemplateStyles to English Wikipedia on 2018-07-19? Thanks! ggellerman closed T199240: Publish project page for TemplateStyles as Resolved. ggellerman moved T199240: Publish project page for TemplateStyles from Non-code to Done on the TemplateStyles board. ggellerman added a comment to T199240: Publish project page for TemplateStyles. ggellerman triaged T199240: Publish project page for TemplateStyles as Normal priority. ggellerman moved T199240: Publish project page for TemplateStyles from Up next to Non-code on the TemplateStyles board. ggellerman created T199240: Publish project page for TemplateStyles. Now that RemexHTML has been enabled on English Wikipedia, what is the plan for deploying TemplateStyles there? ggellerman moved T198618: TOC processing should strip contents of <style> tags from Up next to Doing on the TemplateStyles board. ggellerman triaged T198618: TOC processing should strip contents of <style> tags as Normal priority. ggellerman moved T164879: TemplateStyles style guidance from Non-code to Done on the TemplateStyles board. ggellerman updated subscribers of T196136: CX2: Failure in MT eliminates the paragraph and breaks alignment. ggellerman moved T62856: Create an API module to allow apps to set global preference from Ready to In Development on the Community-Tech-Sprint board. ggellerman moved T188391: Develop strategies and tools for segmenting wikis [2018-19 AP output 4.3] from Backlog to Doing on the Product-Design-Strategy board. ggellerman moved T192971: Mobile Personas from Doing to Done on the Product-Design-Strategy board.